Themes are collections of styles, graphical assets such as images, and skins that define the Flex application’s appearance. There are two available theme formats, a single compiled SWC file and a CSS file. 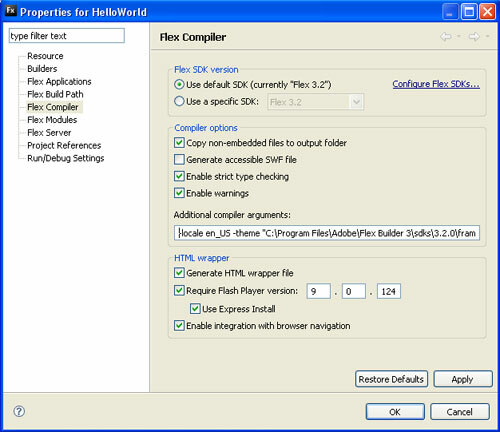 Adobe Flex Builder 3 comes with some predefined themes located on Flex SDK directory, the default location is on C:\Program Files\Adobe\Flex Builder 3\sdks\3.2.0\frameworks\themes directory. 1. By using <mx:Style> tag that points to theme’s CSS file. The tag can be inserted into MXML application after the <mx:Application> tag. The CSS file must be located on project’s root directory, if other than project’s root directory, a full absolute path to CSS file must specified. 2. By adding additional compiler arguments that points to theme’s CSS file. Run the application to open it on Web browser, the appearance should be changed to the new specified theme.